Bogus Grass-Roots Politics on Twitter: Guess Who? Researchers at Indiana University have discovered evidence that political campaigns and special-interest groups are using fake Twitter accounts to create the impression of broad grass-roots political expression. Who would sink so low? Menczer says the research group uncovered a number of accounts sending out duplicate messages and also retweeting messages from the same few accounts in a closely connected network. For instance, two since-closed accounts, called @PeaceKaren_25 and @HopeMarie_25, sent out 20,000 similar tweets, most of them linking to, or promoting, the House minority leader John Boehner's website, gopleader.gov. Just a couple of "Bad Apples" no doubt. Read more about Bogus Grass-Roots Politics on Twitter: Guess Who? "Military Harassing David House, Jane Hamsher for Visiting Bradley Manning"
Welcome to Bananastan, USA. Where the real media of the day get detained by the military and their car towed away and the fake media will probably file a report blaming them for being angry Bloggers. 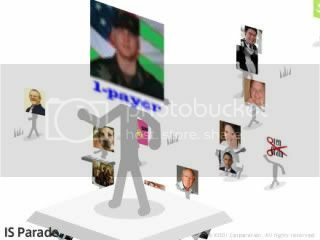 Read more about "Military Harassing David House, Jane Hamsher for Visiting Bradley Manning"
Open Thread - I love a parade! You can watch this twitter parade here... Or you can join this unruly mob here. Read more about Open Thread - I love a parade! In a diary back in February, FishOutofWater wrote of the beginning of what would come to be known in Australia as the Black Saturday Bushfires. Twenty-five people are confirmed to have died in fires north of Melbourne and this morning there are unconfirmed reports of bodies being found in cars overtaken by the fires in Gippsland in the state's east. This morning Mr Brumby said 26 fires were still burning and up to a dozen of them are still very serious. "Every effort is being thrown at the fires," he said. "This is not over yet. Tragically I think there will be more bad news. By the time the smoke had cleared, 173 people had perished in these fires. Two days ago I went to see some of the first responders, firefighters and police, who are currently sacrificing once again to raise funds for a good cause. Back in February of this year in Victoria, Australia we had terrible heat waves taking the lives of many people, over taken in the news by the most destructive bushfire, wildfire in terms of lives and property, in Australia's history. The community is all a-"twitter" about new ways to promote commentaries. With the help of the Drupal community we are in the midst of integrating Twitter Tools for you to use. You can set up your Twitter profile in your member account. After you click on edit, you will see the Twitter and Tweeting options. Please provide feedback. We have done minor testing and it all seems to be working but would appreciate some feedback from the community.